Cultural Compulsive Disorder: The Avengers Vs. The X-Men??? Yeah... I'm In!!! The Avengers Vs. The X-Men??? Yeah... I'm In!!! Company wide crossovers tend to be both a gift and a curse to the world of comic books. Some have produced epic story lines that have shaped the fabric of the companies landscape (Crisis On Infinite Earths & the recent Brightest Day/Darkest Night saga for DC Comics and Secret Wars I& II and Secret Invasion for Marvel Comics). These crossovers have also produced some stinkers (Final Crisis for DC, Acts of Vengeance for Marvel Comics) throughout the years. But Marvel finally announced a crossover for next year that they have been teasing for a bit, and I couldn't be more excited. 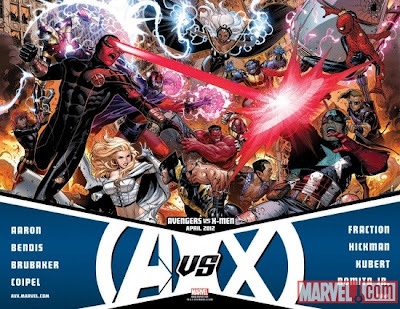 Click after the jump to hear more about the upcoming company wide crossover that will be known as AvX, Avengers vs X-Men!!! The Avengers and X-Men have learned that the all-powerful embodiment of both death and rebirth known as the Phoenix Force is on a crash course for Earth... and it needs a new host to unleash its immeasurable power. But what is the shocking decision tied to the Phoenix's return that will pit the Avengers against the X-Men? And when good friends become bitter enemies, what does this mean for the future of the Marvel Universe? All of this hinges on Hope Summers, a young mutant from the future raised by Cable as a daughter and may or may not be related to Jean Grey (the original Phoenix/Dark Phoenix). Once the Phoenix Force is identified as heading to earth to look for a host, the problems begin. the X-Men feel that they should keep hope with them and begin preparing her for what might happen if she does get chosen to be the new Phoenix. The Avengers have a different view on things and want Hope turned over to them so they can keep her from ever being infected by the Phoenix Force. Neither side seems to be wrong here, so in reality you are actually having a Good Guy vs Good Guy clash that is sure to make for some interesting books. The series launches with a #0 issue in April 2012 and will have 12 issues released bi-monthly. I can't wait!! !